Ben called Jim and wanted him to come with Lucas and try out their new canoe. So they are fishing. They didn't catch anything but sure had a great time. 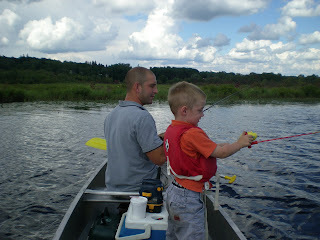 It was Jim's job to paddle the canoe while they fished. 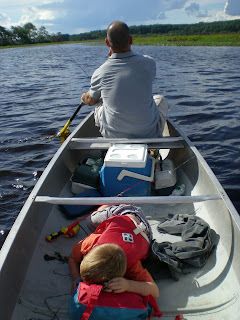 Lucas was so tired from a hard day of fishing that he fell asleep on the way back to shore. I thought this was so cute of him. He is such a loving little boy. This is the Mayflower II I am not sure what happen to one. But it is a lot smaller that I would have thought it should be. They say that its size is like the size of the boats that were used at that time. 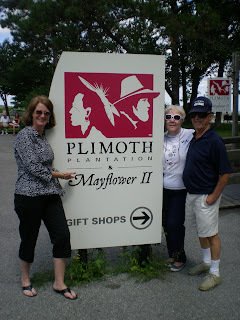 We went to Plimoth and saw the Mayflower with Jim's brother George and his wife Jeannie. We had spent the night at their home and played cards all night it was so much fun playing games with them. I didn't even have to teach them how to play. They new Hand and Foot and Golf. It is so much fun having them up here. They go to Florida in Nov. until May. I miss them when they are gone. 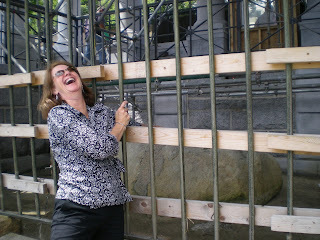 I was laughing here because Jim told me that really about six years ago some people got together and decided that they would take a big rock stamp a date in it and say that this is where the Pilgrims landed and charge people to come and see it. What a money maker that would be. 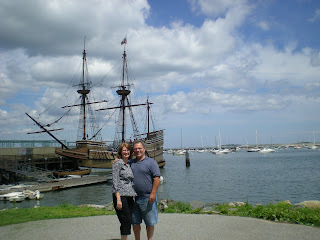 Here we are at Plimoth rock. 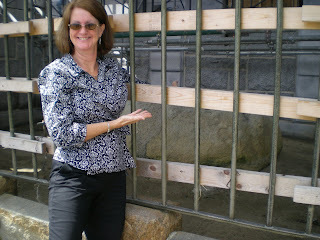 I told Jim that I thought is was funny that the Pilgrims landed jumped off the boat and hammered the date on the rock where the boat hit. I was laughing so hard that I couldn't stop. People were looking at me funny. I'm so glad that you are back in the blogging world and that you both are doing well. I'm also very impressed that you made it through this trip, was the ambulance on standby? I think the rock is pretty funny too.